If zombies took over, would you fight? 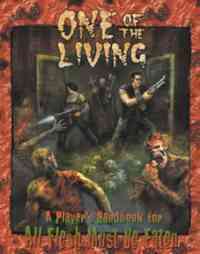 One of the Living is a supplement for All Flesh Must be Eaten that focuses on the survivors. The opening fiction sets the tone for this dark, survivalist supplement. While there were a few grammatical errors, the language is vibrant and photographic. You feel as if you are right behind Jack, with a hand on his shoulder, as he struggles to retell his story. When you realize that Jack’s hope orbits around the impending daybreak, you understand that this is not your typical All Flesh supplement. Overall, the flavor text is well-written and does a good job of enhancing the desperate setting. Psychology, socialism, and personality depths come to be the standard for player-characters. Qualities and Drawbacks reflect the breadth of this new aspect to All Flesh. Insomnia, Obsessive-Compulsive Disorder, and Hallucinations take a character from their past to the post-apocalyptic present, causing characters to be real. In this game, you want your character to last. With qualities like a Green Thumb, your character may do just that. But she can’t do it alone. Not without help. For characters seeking a more religious or supernatural overtone, One of the Living offers the option of divine intervention. Even though the supplement undoubtedly includes all religions in this light, there is a light Christian feel (Pride of Lions) (Walk Through the Valley) to the section on “The Inspired.” Because it’s optional, not a lot of time is spent on it. For Zombie Masters running a supernatural game, a list of Artifacts is included that may have redeeming or devastating results. The Artifacts span world myth, and give an archaic feel to their power and availability. Witchcraft, another Eden Studio’s product, is mentioned as a suggested resource. No doubt a more experienced Zombie Master will pull material from this book. Having a supernatural element to an AFMBE game that portends to be a longer, survivalist campaign allows for more hands-on interaction between the Zombie Master and players. After all, who better than the ZM to create a miracle? Other goodies are optional combat rules and new skills like Scavenging, which is very useful in this setting. Four new archetypes are also presented, the High School Janitor shows ingenuity. True to the Eden Studio’s style, the archetypes are written similar to anything else you’d find in an All Flesh product. The personalities are appropriate to the Zombie Rise, playing an embittered character might even help you survive. What follows is a “How-To” guide to have players work together to scavenge what they need. Some items are basic (food, water) some more advanced (jury-rigging explosives, testing machinery, having power). This section takes a Zombie Master by their bony hands and shows them what needs to be done. Scavenging has two side effects in game. One effect is that it allows characters to interact with each other on a more, intimate level. Sometimes a found radio will work, sometimes it won’t. Sometimes, a character needs to make more than one trip from their makeshift camp to find a radio. This attribute incurs a second effect, a longer, character (or story) driven campaign for All Flesh Must Be Eaten. Players of AFMBE know all too well that characters can have a very short life span. Depending upon the game, it is not unheard of to only live for 20 minutes before losing a vital organ. Accumulating piles of stuff is tricky as One of the Living, because as a character within a team the object has to be both useful and easy to carry. The list of ideas for useful items runs from the practical (caffeine pills) to what could be considered a luxury item in this setting (snowmobile). Here’s the crux, acquiring these items without paying some form of currency depends not only on the time of the story, but the place it’s acquired. For example, if your game takes place after the zombie rise and your team just happens to come across a Medusa Revolver? As long as the Zombie Master says it’s fair game, it is. If that Medusa Revolver is in a makeshift trader town, you may have to trade something of value (anything goes) to get that gun in your inventory. Vehicles do exist in this setting and, if you’re lucky enough to find one, the same rules apply. Here is where the Zombie Master must wield a fair hand and have clear direction. Players that thought obtaining stuff was easy will find themselves immersed in politics over the simplest of items. They might think twice about jury-rigging their own set of snowshoes. ZM’s writing a longer campaign need a bit of finesse. The techniques offered to the ZM in Chapter 5 round out the AFMBE corebook with an in-depth look at the elements of survival. Regardless of whether or not you are running a campaign in this setting, this chapter provides invaluable insight into how to manage character interaction, directing the rise of the zombies, handling psychological trauma, and understanding where your game may be headed. A nice touch for ZM’s is the Campaign Design Sheet, which works as a great tool to organize creative ramblings into a structured game. For those that like to create your above-average zombie, a full chapter is devoted to the walking dead and zombie physiology. Like a medical surgeon, Chapter Six walks you through the stages of a zombie’s unlife. Additional zombie aspects are included to round out the zombie devotion. Ready to run a game? The book winds up with additional Deadworlds and a full-length campaign. Otherwordly dimensions, politics gone bad, weird science, and historical hiccups inspire ZM’s to inflict zombie-lovin’ goodness on their players. The Deadworlds have additional archetypes included, be sure to reference them even if you plan on creating your own world. The full-length campaign is complete with suggested NPCs, a general setting (Sunset Falls) as well as a specific setting (Cranston Prison). Sunset Falls takes the guesswork out of setting so ZM’s can focus less on story and more on their players. For those wanting a taste of a longer-style game, the campaign is tastilicious. Two appendices are included with One of the Living. For any player planning to stay alive in an AFMBE campaign, Appendix A: Surviving a Zombie Attack is a must-have/must-read. Not only does the Appendix help the ZM by suggesting a full range of “shopping lists,” approaches to combat, travel, defense and determining the scale of the zombie rise arms a player to the teeth. In fact, this Appendix is so useful players could easily reference it as a guide while in game. Overall, One of the Living is extremely helpful to understand what happens when the zombies rise. Regardless of how long (or how many) zombies have been around, ZM’s and players alike will appreciate this complement to AFMBE. Due to the content in this supplement, I would advise reading it regardless of Deadworld or campaign you are involved with. This supplement is the authority on what to do when the zombies start biting. Look for All Flesh Must Be Eaten eBooks at RPGNow.com.